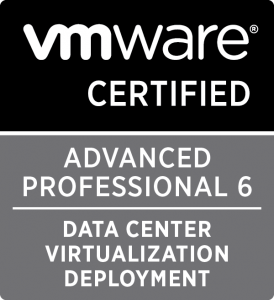 On October 13th I was awarded with the VCAP6-DCV Deployment certification that completes the requirements for the VMware Certified Implementation Expert 6 – Data Center Virtualization (VCIX-DCV). @Mordi_s’ vPentathlon study guide was an invaluable resource when practicing before the exam. 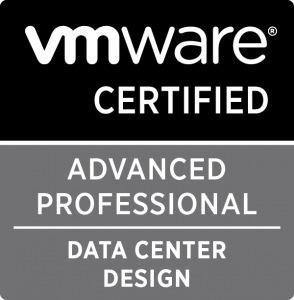 In addition to the study guide, VMware’s Hands on Labs provide a fantastic lab environment* with a feel similar to the exam’s lab. *When I sat for the VCAP6-DCV Deployment exam, the lab used vSphere 6.0.0 with no updates — the Hands on Labs at the time used vSphere 6.5 beta — this is a huge difference, as many vSphere Web Client actions/tasks/features were not added until 6.0 U1 and U2; as a result, I was forced to drum up ESXCLI and PowerCLI commands for several tasks/scenarios in which I normally complete using the Web Client. Also of note, while the Control key is disabled in the lab, accidentally hitting Ctrl + R to refresh the Web Client resulted in a disconnection from the lab; this reconnect consumed about 10 minutes of the very, very valuable exam time.